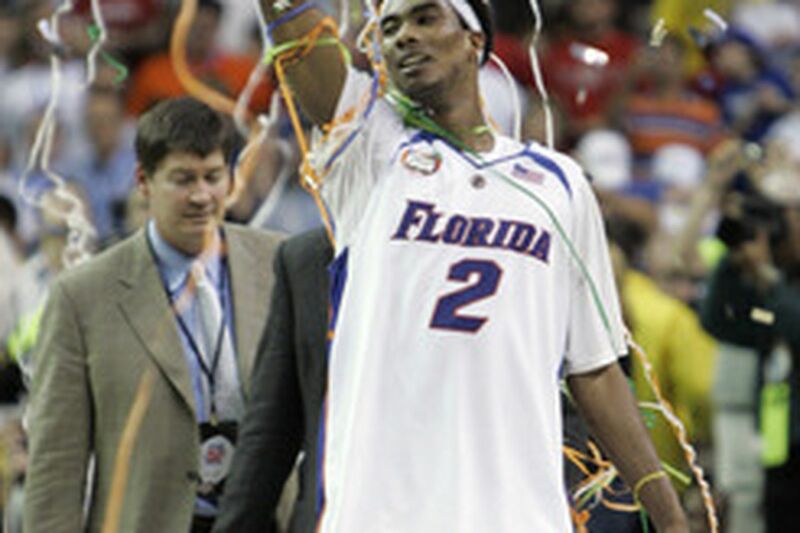 Corey Brewer celebrates amid confetti after Florida's win over Ohio State for national title. ATLANTA - When you do it once, you celebrate. When you do it twice, everybody celebrates. They all came back to see if it was possible. They proved it about as definitively as a team can prove it last night at the Georgia Dome. Everything Florida has done for two seasons was on display one final time. It was equal parts breathtaking and mesmerizing. It was fast from end to end. It was passes that hit shooters in position to fire. It was screens that set the shooters free. It was three treys in 92 first-half seconds as the Gators broke the game open. It was defense that eliminated everybody from Ohio State except the amazing Greg Oden (25 points, 12 rebounds, four blocks), who finally got a chance to show everybody what he was all about. It was one against five for most of the game. Even Oden, who blocked everything in his vicinity on defense and was unstoppable on offense, isn't going to win that game. Oden's performance was as good as any big man's in the championship game since Bill Walton in 1973. But Walton had way more help. If one player epitomized everything Florida was about, it was Corey Brewer, who was named the Most Outstanding Player of the Final Four. He blocked Oden. He got a layup caught by Oden on a play that was Bill Russell-like and, unconcerned, nailed a three on the next possession. He ripped the ball from Mike Conley and did a 40-foot fly by ending in a gravity-defying jam. He eliminated Ron Lewis, who entered the game as the tournament's leading scorer with 96 points. Florida won this game from the three-point line. The Gators were 10-for-18, the Buckeyes 4-for-23. That is 30-12 and way too much. Early, the Gators lived at the foul line. It helped give them a working margin they would never give up. By halftime, the Gators had outscored the Buckeyes from the foul line and three-point line, 26-5. For the game, it was 52-23. The pace was clearly wearing down Ohio State. It was fast and then faster. Ohio State's small guards were shooting over what must have seemed like a volleyball net. The five who came back each has scored 1,000 points. Nobody knows the last time a team had five 1,000-point scorers. Savor it. If it ever happened before, it is never going to happen again. Brewer, Taurean Green, Joakim Noah, Al Horford and Lee Humphrey have combined to score 5,735 points. UCLA dynasty that, incredibly, won 38 consecutive NCAA games from 1964 to '74. That was a different world. In this world, Florida is the standard. In the 12 NCAA games, the Gators outscored their opponents by a combined 181 points. In this tournament, they got an amazing 15 more boards per game than their opponents. This season, they led the country in shooting percentage and were third in rebound margin. By any definition, this was a dominant team, a team very deserving of its place in history. encompassed what the word team means. They did it the first year with no expectations, then they did it again with all the expectations." rebounding, helping on defense) that nobody wants to do anymore, and Green by running the game from the point and keeping the other team's point guard out of the lane and breaking down the defense. So, will they try again? "Hey, you never know with the Gators," Brewer said. "If one of us [juniors] stays, we all stay." That's what they said last year when they were sophomores. And they did what they said. This time, it would simply be too much to ask. We got what we got. Savor it.